Meli-Šipak II, or alternatively Melišiḫu[nb 1] in contemporary inscriptions, was the 33rd king of the Kassite or 3rd Dynasty of Babylon ca. 1186–1172 BC (short chronology) and he ruled for 15 years. [i 3] His reign marks the critical synchronization point in the chronology of the Near East. He is recorded as the son of Adad-šuma-uṣur, his predecessor, on a kudurru. [i 4] Elsewhere he seemed reluctant to name him in his royal inscriptions, despite Adad-šuma-uṣur’s apparent renown as restorer of Kassite independence, which has been the subject of much speculation amongst historians. The “II” designation is probably an error caused by over reliance on a single inscription[i 5] naming one Meli-Šipak, son (=descendant) of Kurigalzu II. He was the last king to bear a wholly Kassite name. 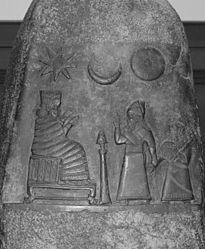 Meli means servant or slave, Šipak was a moon god, but Šiḫu was possibly one of the Kassite names for Marduk. Confirmation of the firm foundation of Near Eastern chronology was provided recently by the discovery at Assur of his correspondence with Ninurta-apil-Ekur of Assur (FRAHM n.d.), thus confirming the overlap of these reigns as required by the independent chronologies of Assur and Babylon set forth over thirty years ago by J. Brinkman. The length of Ninurta-apil-Ekur’s reign is uncertain, as extant copies of the Assyrian King List differ, between three or thirteen years. From the reign of his son and successor, Aššur-dan I, they are consistent, and supported by extant limmu lists from 892 BC on. His rule is understood to have been peaceful. Not so for the edges of his kingdom, where the catastrophic collapse at the end of the bronze age was starting to dramatically unfold with many of the cities of the Levant experiencing destruction. The city of Emar, situated in northern Syria, was sacked and a legal document[i 6] was found on the floor in a private house there, dated to his second year. The tablet is a short term contract and historian Daniel Arnaud has concluded that only a very short time (“weeks”) elapsed between its preparation and the cataclysmic destruction of the city by “hordes of enemies”. Despite the carnage wrought by the times on mighty empires such as that of the Hittites, whose capital Hattusa was sacked around the middle of his reign, there continued to be scientific scribal and construction activity in Babylonia. A divination text[i 7] lists 25 omens determined by the flight path of a falcon, or surdû, and raven, or āribu, and was written by Bēl-nadin-šumi, son of Ila-ušaršanni, and dated the month of Araḫsamnu, the 8th day, the 3rd year, the 2nd year,[nb 2] using the curious double-dating formula adopted during his predecessor’s reign. It begins, “If a man goes off on his errand and a falcon crosses from the right of the man to the left of the man - he will attain his desire.” Meli-Šipak was responsible for building work on the Ekur at Nippur,[nb 3] the Egalmaḫ at Isin, and a later text,[i 8] a Neo-Babylonian temple inventory, records his benefactions at Ur. 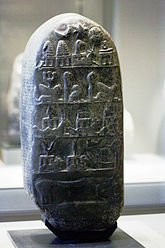 A boundarystone (kudurru) reports of his passing some land with tax exemptions to his son and successor Marduk-apal-iddina I (Land grant to Marduk-apal-iddina). [i 2] His daughter Ḫunnubat-Nana(ya) was also the recipient of a land grant,[i 1] which her father had purchased on her behalf, disproving the erstwhile theory of Kassite feudalism that all land belonged to the Monarch. A kudurru records the lawsuits concerning the estate of Takil-ana-ilīšu over three reigns, spanning Adad-šuma-iddina, Adad-šuma-uṣur and Meli-Šipak. [i 4] This is notable because Meli-Šipak upholds the decisions of both his predecessors, one of whom, Adad-šuma-iddina, may have been merely a vassal king of Assyrian patronage. ↑ 1.0 1.1 1.2 Land grant to Ḫunnubat-Nanaya kudurru, Sb 23, published as MDP X 87, found with Sb 22 during the French excavations at Susa. ↑ 2.0 2.1 2.2 Melišipak kudurru-Land grant to Marduk-apal-iddina I, Sb 22, published as MDP II 99, found during the French excavations at Susa. ↑ Kinglist A, BM 33332, ii 12. ↑ 4.0 4.1 4.2 Estate of Takil-ana-ilīšu kudurru, BM 90827, published as BBSt 3, column 4, line 31, but note King’s 1912 edition uses the alternative reading of the cuneiform –MU-ŠEŠ to give Adad-nadin-aḫi. ↑ ”Knob” of red stone with votive inscription, BE 6378. ↑ Legal text Msk. 73273. ↑ Omen text BM 108874. ↑ Temple inventory IM 57150. ↑ 9.0 9.1 Land grant to Ḫasardu kudurru, BM 90829, published as BBSt 4, in the British Museum. ↑ 10.0 10.1 Land grant to [Me]li-Ḫala kudurru, Louvre 6373, published as MDP II 112. ↑ Meli-Šipak's decree BM 38124 tablet in the British Museum. ↑ Unpublished kudurru, mentioned in MDP I 180 no. 12. ↑ Stele of Meli-Šipak with Šutruk-Naḫḫunte colophon, Sb 14, published as MDP IV 163. ↑ Me-li-dŠI-ḪU or mMe-li-ŠI-ḪU, where the reading of ḪU is uncertain, -ḫu or -pak. ↑ Stamped bricks from altar of the Enlil temple, Nippur, from the Oriental Institute’s 1950 excavation. Wikimedia Commons has media related to Meli-Shipak II. ↑ L. W. King (1912). Babylonian Boundary Stones and Memorial-Tablets in the British Museum. British Museum. p. 16. ↑ Bernard Newgrosh (2007). Chronology at the crossroads: the late bronze age in western Asia. p. 267. ↑ J. A. Brinkman (1976). "* Meli-Šipak". Materials and Studies for Kassite History, Vol. I (MSKH I). Oriental Institute of the University of Chicago. pp. 253–259. ↑ Ahmad Hasan Dani; Jean-Pierre Mohen; J. L. Lorenzo; V. M. Masson, eds. (1996). History of Humanity: From the third millennium to the seventh century B.C. Unesco. p. 479. ↑ Malcolm H. Wiener (2006). "Egypt & Time". Egypt and the Levant. 16: 326. ↑ Donald John Wiseman (1965). Assyria and Babylonia c. 1200-1000 B. C., Volume 2, Part 31. Cambridge University Press. p. 11. ↑ 8.0 8.1 Robert Drews (1995). The End of the Bronze Age: Changes in Warfare and the Catastrophe ca. 1200 BC. Princeton University Press. pp. 6, 15, 18. ↑ Edward Lipinski (2006). On the Skirts of Canaan in the Iron Age. Peeters Publishers. p. 28. ↑ J. A. Brinkman (1999). Dietz Otto Edzard, ed. Reallexikon Der Assyriologie Und Vorderasiatischen Archäologie: Meek - Mythologie. 8. Walter De Gruyter. p. 52. ↑ Daniel T. Potts (1999). The archaeology of Elam: formation and transformation of an ancient Iranian State. Cambridge University Press. pp. 207–208. ↑ Allison Karmel Thomason (2006). Luxury and legitimation: royal collecting in ancient Mesopotamia. Ashgate Pub Co. p. 104. ↑ V. Scheil (1908). Textes élamites-sémitiques, Mémoires de la Délégation en Perse. 10. Paris: Ernest Leroux. pp. 87–94. + plates 11-13.